Cor de la Generalitat Valenciana, Orquestra de la Comunitat Valenciana / Ramón Tebar. 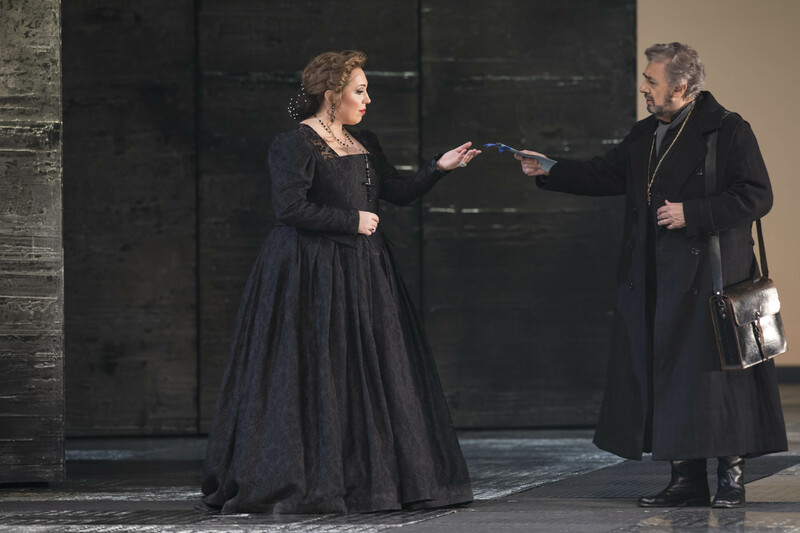 Tonight’s Don Carlo marked the official start of the Palau de les Arts 2017 – 18 season. Sadly, the evening took place under something of a cloud following the resignation of the house’s Intendant, Davide Livermore, earlier in the week. Valencians are extremely lucky to have a theatre of this quality in their city – the architecture is stunning, the orchestra excellent and the chorus surely ranks as one of the top three in the world. 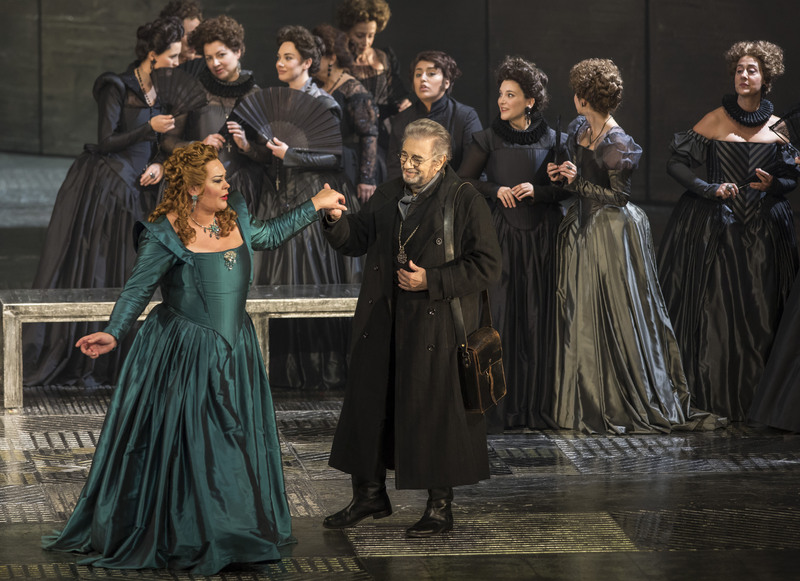 This evening also marked the return of Plácido Domingo to the house, this time in the role of Posa. He is a figure closely associated to the theatre – in fact the house’s young artist program, the Centre Perfeccionament, is named after him. Joined by a very impressive cast, there was a capacity audience at the Palau tonight. Marco Arturo Marelli’s staging was imported from the Deutsche Oper Berlin, where I saw it a few years ago – also with Violeta Urmana’s Eboli. Notable for imposing sets (also Marelli), large marmoreal panels give a flexibility to the stage vistas that create memorable stage pictures through the placement of the blocks, as well as through the placement of the singers on the stage. This is helped by the use of stark colours – red for the clerics, green for Eboli, black for the majority. 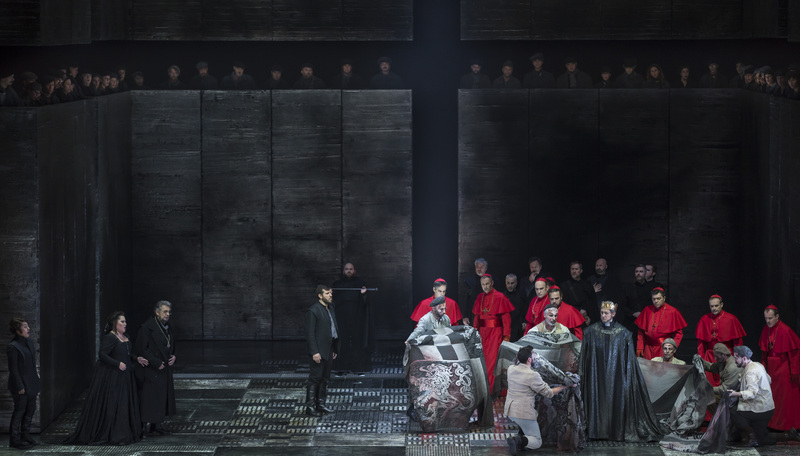 Unlike other directors, Marelli doesn’t shirk from showing the brutality at the heart of the regime – we see the heretics strung up, about to be burned at the stake, and the heavenly voice is a woman whose baby is grabbed from her and handed over to the priests. The constant presence of a large cross reflects the fact that for Filippo, his power is sustained by the church and without it, he has nothing. This was especially vivid in the confrontation between him and the Inquisitor, where Alexander Vinogradov’s Filippo stared at the crucifix as if to ask it for answers that fail to come. There is a sense of loss and futility here that I found especially convincing. Marelli also succeeds by illustrating the accompanying events much more vividly than is often otherwise the case. For instance, we see Eboli walking to the King’s chamber as he and Posa duet, or Eboli giving Tebaldo the note to transmit to Carlo to set up the assignation in the garden. There is a sense, with characters visibly watching from behind the scenes or over the top of the set, that nothing happens in isolation. Overall, it’s a successful piece of theatre although there was occasionally a sense of individuals resorting to stock operatic gestures – an outstretched arm or expressing love to the front, for example. We got the four act version and additionally, Eboli’s veil song was shorn of its closing measures. Musically, it was a very strong performance. Andrea Carè gave us a truly Italianate Carlo with youthful tone and clarion cutting power in places at the top. He does have a tendency to swoop up to higher notes and sustained higher passages sounded somewhat tight. I also wished that he had dared to sing somewhat more quietly in the closing duet, which was sung at mezzo forte. Still, he has a handsome sound, made much of the text and most certainly has the raw material. María José Siri is a very exciting find as Elisabetta. She is a real deal spinto with a big, voluptuous sound combined with an attractive duskiness and an even vibrato. The voice is well placed, resonant and carries well. Her ‘tu che le vanità’ showcased her beautiful legato as well as some impressive control of dynamics with an impeccable double hairpin on ‘Francia’. Perhaps, there was an interpretative coldness there and the very top seems slightly disconnected and shallow, but Siri really is a major talent. Urmana’s Eboli is of course a known quantity. She tore up the stage in her ‘don fatale’, giving us a barnstorming rendition, refusing to hold back. The top is most definitely still there with a fabulous high B-flat at the end, taking on exciting amplitude. She also negotiated the corners of the veil song with ease and included a genuine trill. Urmana made Eboli a much more complex and rounded character than we often see. She shaded the tone, making use of a range of vocal colours, to bring home Eboli’s remorse to Elisabetta, for example. The registers may have started to part company but Urmana is a consummate artist and transcends this. Alexander Vinogradov was a much healthier and younger Filippo than we often hear. His is a typically lugubrious eastern European bass with a slightly acidic edge. The text wasn’t always as clear as it could have been but his legato is impeccable and he sang ‘ella giammai m’amò’ with great feeling, bringing Filippo’s frustration and powerlessness to life. The confrontation between him and Marco Spotti’s Inquisitore was tremendous – both fresh voices, sparring and striking sparks off one another. Domingo received a massive ovation at the closing curtain and he is clearly loved by the public here. Is he a Posa? I’m not convinced that he is. The voice sits too high, he still sounds like a tenor and lacks the warmth and depth of sound that the role needs. The lack of contrast between the voices was most apparent in the Carlo-Posa duet. His phrasing was choppy and short and the voice was arid at the bottom. Yet, there is a lifetime of understanding here. The vibrations were always even and the musical instincts always solid. While I am glad to have had the opportunity to be witness to his artistry, I did regret the opportunity to hear a genuine baritone in the role. The remaining roles were excellent and paid tribute to the extremely high standards of the house. The orchestra played particularly well, with some ravishing half-lights in the strings in the prison scene. There was a warmth and depth to the string tone that I found most compelling. The brass also played well. Ramón Tebar’s conducting, I found problematic. I felt that he conducted from measure to measure as opposed to taking a longer view, with tension sagging far too often. Tempi often felt too flaccid and in other places felt too rushed – the Filippo-Inquisitore confrontation felt skated over. Perhaps this could have been first night jitters and in the remainder of the run, things will in fact settle down. I have left the chorus until last as the ladies and gentlemen of the Cor de la Generalitat Valenciana were perhaps the real heroes of the night. They made an absolutely massive sound, yet it was always so well balanced. Right from the start, with the offstage gentlemen singing with impeccable intonation and wonderful blend, they set their stall for the evening ahead. In the auto-da-fé, they blew me away, not just by the amplitude but also by the honesty and directness of their communication. The tenors shone out of the textures but the sopranos also distinguished themselves by their warmth of tone, yet it was far from the war of vibratos we hear elsewhere. Most impressive. Tonight, didn’t quite feel completely settled – the conducting felt episodic and lacking in a long term view – but this is not unusual for a first night. 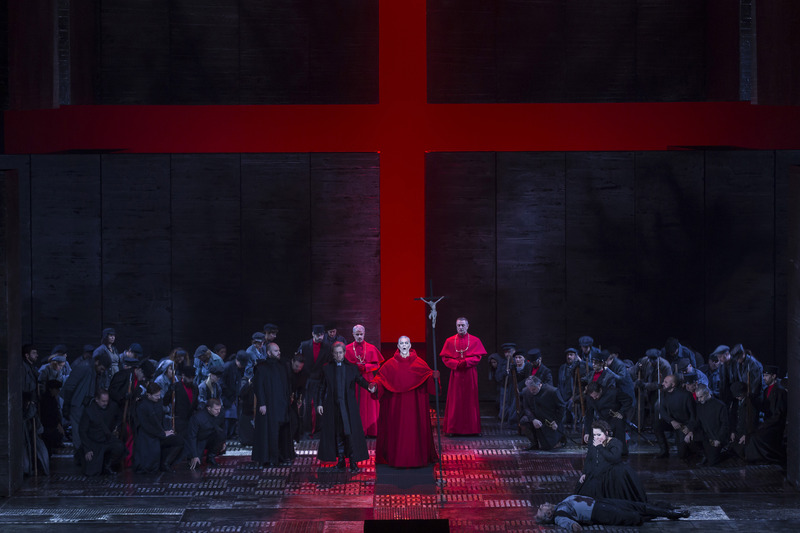 Marelli gives us such an intelligent staging, a musing on power and the role of religion in sustaining that power. He also gives us more than that – he makes the work about a group of living characters who are products of their environment. It was very well sung on the whole and is most certainly worth making the journey to see.